The new Epiphany, a Joie de Vivre hotel, was formerly Casa Olga, a residence for disabled and elderly people that opened in 1971. The remodeled building has been reimagined as an 86-room, four-star hotel with Lure + Till restaurant on the first level. Auerbach Glasow provided architectural lighting design services for the exterior of the hotel. Perforated metal panels now cover the street level structure as a new “skin” and give the hotel a modern look. 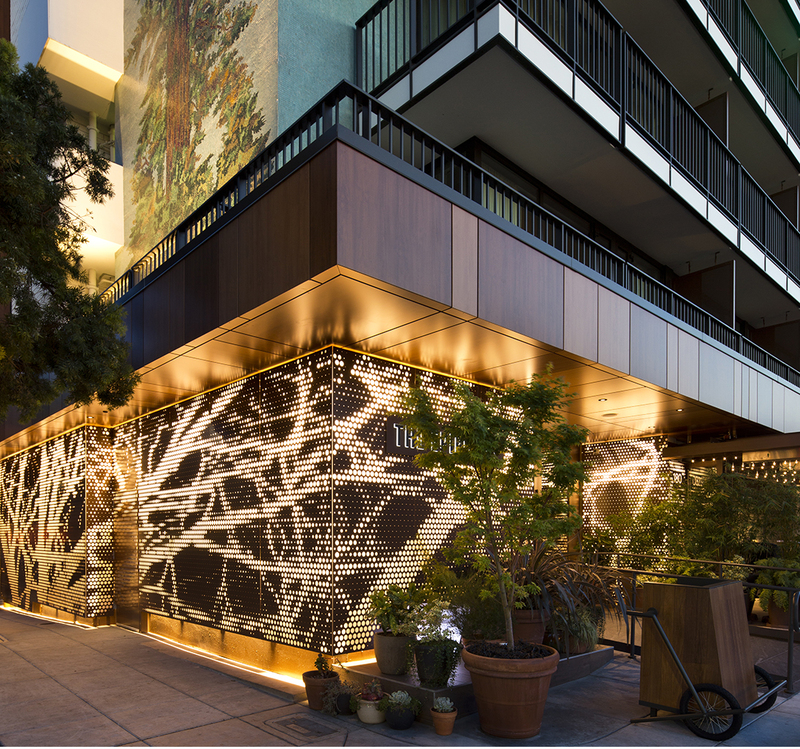 The panels are backlit, defining the building’s street presence with a tree motif punched out of the panels and integrated signage. The firm also provided lighting for the exterior dining portion of the restaurant which operates 24-hours a day. The building facade retains the large mosaic of a redwood tree which is the city’s namesake – El Palo Alto. The iconic and locally recognized mosaic is prominently highlighted and identifies the hotel from blocks away. The design team successfully brought the 1970s era tower into the modern age, making it fit right in with the character of Silicon Valley.